The shirt was a perfect fit for Parker and his Spurs. San Antonio is back in the NBA Finals for the fifth time in franchise history after sweeping the Memphis Grizzlies in the Western Conference finals. Parker was the lead engineer of the total destruction of the Grizzlies’ once vaunted defense, ripping Memphis for 37 points in the series-clincher. In the two games in Memphis, Parker averaged 31.5 points and made 26 of his 43 shots from the field, a whopping 60 percent accuracy. ”He’s been amazing. Every year he gets better and better and better. He’s been carrying us,” first-team All-NBA center Tim Duncan said of his second-team All-NBA point guard, who is finally getting the recognition he richly deserves after 12 seasons in the Association. For much of his 16-year NBA career, all with the Spurs, Duncan has been the main frame of arguably the model franchise of the league. But for the last two or three years, the offense has been turned over to Parker. “I’ve said it a lot of times this year, he has played better than any point guard in the league,” Spurs coach Gregg Popovich said of his 31-year-old star. “He got hurt, got a little unsteady for awhile from the ankle [injury]. Once we got in the playoffs he started returning to form. The vote of confidence from Popovich was a huge deal for Parker, who admitted during the infancy stages of his soon-to-be Hall-of-Fame career that Popovich would grill him over and over about finding a balance between scoring on his own and creating shots for teammates. Now, it is no longer an issue. Parker has full command of the offense and Popovich has total confidence he’ll make the right call each time. ”He’s always trusting me and letting me grow as a point guard and calling plays. Before in my career I was always looking at him. Now I don’t look at him,” Parker said. The turning point in the Popovich-Parker dynamic happened sometime after the 2011 European basketball championships in Lithuania. Parker led his native country France to a silver medal, the best finish of any French national team at EuroBasket. During the tournament, Parker was nearly unstoppable. He was driving, hitting jumpers, setting up teammates, and running circles around the other top European point guards. Popovich watched Parker dominate the competition and played with so much freedom. 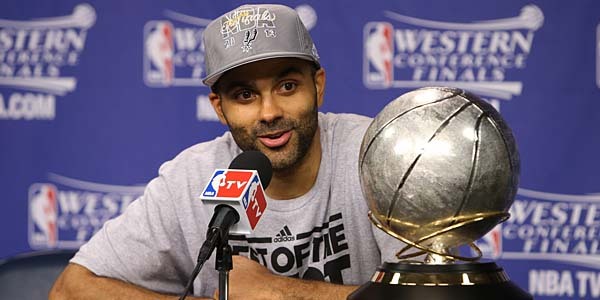 When Parker returned to San Antonio, Popovich told him he wanted to see the Tony Parker from the 2011 EuroBasket. Popovich had the foresight that in order for the Spurs to evolve and keep up with some of the younger teams in the league he needed Parker to call his own shots, push the pace to his liking, and play without any restrictions. Once Popovich gave the keys to Parker, the Spurs busted out of their conservative shell and became more dynamic. They went from driving a Cadillac to driving a Ferrari, with Parker holding the steering wheel. Despite all of his accomplishments, including winning the 2007 NBA Finals MVP and owning three NBA titles, Parker is rarely mentioned when basketball experts talk about the five best point guards in the NBA. But Parker is OK with that.